Being a high school math teacher is a noble profession, one that requires a sense of humor, mathematical knowledge (naturally), excellent communication and listening skills, a rapport with students, and great patience. You may be excited about the prospect of getting the summer off of work and teachers certainly deserve it and have certainly earned the break. A high school teacher’s school year is packed full with planning classes, attending fieldtrips, grading papers, filling out forms, meeting deadlines for the school district and most importantly investing in kids’ lives. Taking the necessary time to complete a bachelor’s degree in education, specializing in mathematics, is necessary in your goal of becoming a high school math teacher. 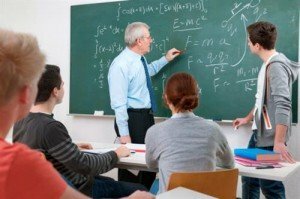 You will learn how to teach math to younger students and also how to make lesson plans, how to traverse the wiley world of required high school math courses, and also earn the required hours of student teaching before you graduate. One simple way to accomplish your goals of higher education is through online courses taken in the comfort of your own home and managed to fit into your personal schedule. This can be a very effective way to earn your degree while working a full-time job, if that is your desire. If you have already earned a bachelor’s degree and have natural math skills, you may have the option of working in the classroom while you earn your education degree. Check with the education board in your state to see if this is a possibility for you. State requirements vary, but you may need to earn a masters degree also in order to become a high school math teacher. Many top universities and higher learning institutions also have online courses to complete a masters degree in mathematics or a master of arts in teaching (MAT). Get a state teaching license. In order to become a qualified math teacher, you need to get your credential including an “endorsement” in math. Part of the requirements for this certification is passing a state test, called the Praxis I and II, in the state which you will be working. And then you’re ready for the next step. Finding a job does not have to be burdensome any longer. With all information at our fingertips through the internet, schools and job sites can tell you every school in the nation that is looking for a math teacher. If you are looking for a position in your own town, stopping by the schools in person is a great way to make an impression and to see whether that school would be a good fit for you. A math teacher may teach as many as five or six classes each day. A math teacher may also have to supervise the lunch room, study hall, after-school programs, detention center or even a sport activity during the week. A math teacher must maintain classroom discipline even when students are resistant or being actively rebellious in class. A math teacher has a full day with very limited planning times. A math teacher’s planning period is packed with planning lessons, keeping grades and attendance current and filling out progress reports. A math teacher’s day does not end when school lets out. There is always more planning for the next day or grading papers and even extended learning courses to keep up with the latest teaching trends and motivational ideas to keep your students fully engaged. As mentioned above, being a math teacher is not for the faint of heart, but is truly noble.